Spider-Man, Spider-Man, who hasn’t played the video game called Spider-Man. If you haven’t you should, and if you have you’re probably obsessed. Don’t worry I’m not judging, in fact, I play it any chance I get. However, I have somehow summoned the strength to put down the controller in order to read a comic based in the same universe as the game (a.k.a. Spider-Geddon #0). So I guess I’m not completely obsessed . . . right? Spider-Geddon is on the horizon! The Inheritors are back with a vengeance and once again it’s time to summon the Spider Troops. So far (if you count tomorrow’s Edge of Spider-Geddon #4) we’ve seen four different recruits for the war against the spider eating weirdos. Which leaves this one-shot and one more a.k.a Superior Octopus (which I think is a one-shot), until Spider-Geddon #1 (Oct 10). 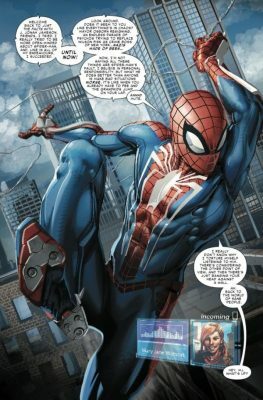 In this one-shot, we see everyone’s new favorite Spider-Man from Earth-1048 in his comic debut! Which happens to be an action filled, quip-heavy, fast-paced team up with Superior Spider-Man. Together they take on a wicked old school Spectacular villain who I won’t reveal. However, I will say that said villain looks totally bad @$$. This story is your average crossover lead up, but it’s still a fun read. Plus it’s a cool look at the video game world we’ve come to love. Also, the art by Clayton Crain is as epic as always. He is the perfect choice to bring the video game to the comic pages. There is a little side story of a foreboding nature written by Jed MacKay. Also a staple of a lead-up book, but also entertaining. The art by Javier Garron is a little more cartoony than the main story but still fits. This little filler story gives us a little insight into what the Inheritors have been up to since we last saw them. Also worth mentioning is the very cool looking Spider-Geddon advert/pin-up illustrated by David Baldeon and Andres Mossa. 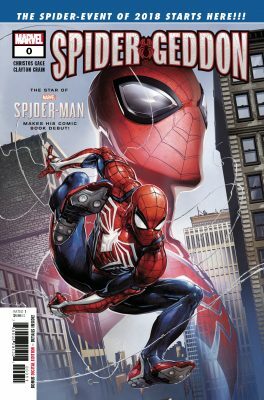 If you can pull yourself away from the screen for a few minutes, then head on down to Alpha and grab your very own copy of Spider-Geddon #0. If you like the world that has been created in the game, then you’ll enjoy seeing it transition to comic form. With great art and a fun story, you’ll find yourself happily putting aside precious gaming time to read it. Just don’t waste too much time, you still have backpacks to collect!